From the front lines of war to a staple of institutional catering, Spam is rarely seen as a gourmet ingredient – but the canned pink meat holds a unique position in South Korea as a top-selling holiday gift. Ahead of the Chuseok harvest festival which starts Sunday – also known as “Korean Thanksgiving”and an occasion for mass family gatherings – presentation wooden boxes of the blue-and-yellow tins, nestled in packing straw, line the shelves of both major retailers and local convenience stores. An upmarket black-label pack with six cans of Spam and two bottles of Andalusian olive oil costs over 90,000 won (US$80), but the most popular version is a nine-tin set at 30,000 won. Office worker Lee Yoon-ho bought five to give acquaintances, calling it “the most universal” present. “It’s affordable and everyone likes it,” he said. In the West, the pink brick of precooked pork shoulder and ham first launched by US conglomerate Hormel Foods in 1937 is now largely a thrifty pantry item. But around 213 billion won worth of Spam gift boxes were sold in South Korea last year – six times as much as in 2008, when the figure was first recorded. 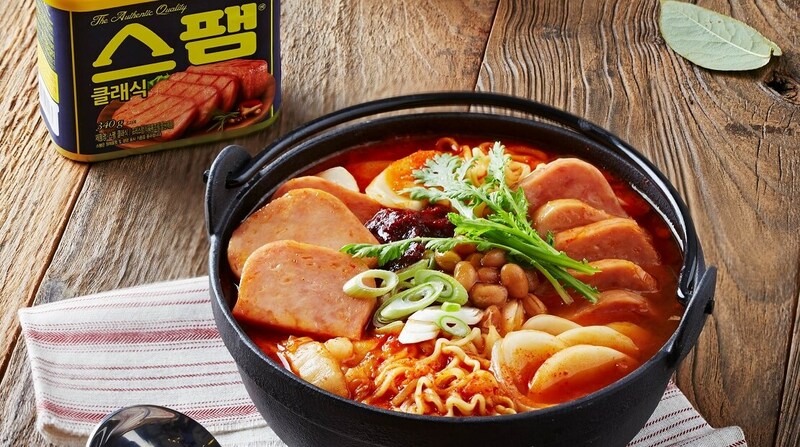 A spokeswoman for supermarket giant Homeplus said the tinned meat hampers ranked second, third and fourth in its top-selling products last Chuseok. The concept would be incomprehensible elsewhere, according to Da-Hae West, author of the English-language cookbook Eat Korean. “In Western countries, Spam is considered a cheap substitute to fresh meat and people nowadays tend to view it fairly negatively as they associate it with ration packs and poor quality meat,” she said. But the highly processed aspects of Spam that turn some diners’ stomachs actually enhanced its appeal in Korean cuisine, she said. Spam was introduced to the peninsula by the US army in the 1950s, when civilian food supplies were running low – with meat scarce – during the Korean war. Some Koreans received the foreign canned meat – then a symbol of nutrition and wealth – from American soldiers, while others found scraps of discarded Spam near military encampments. At a time of crushing poverty, South Koreans invented a new menu called budae jjigaeroughly translating into “army stew” – a concoction of Spam, canned beans, sliced cheese and kimchi which is still widely popular. And over time Spam has become a part of South Korean food culture, with both young and old favouring the canned pink block. “It is seen as a premium product in Korea,” said Hormel’s senior brand manager Jaynee Dykes. American snowboarder and Olympian Chloe Kim – who has Korea-born parents – grew up eating Spam and it remains one of her favourite snacks. “We always have Spam in our food storage,” her father told USA Today Sports during the Winter Olympics in the South in February, when Kim won gold. Spam emerged as a popular gift during the Asian financial crisis of the late 1990s, when South Koreans sought an affordable alternative to fruit baskets and beef sets during the season of giving. But even after the recovery, demand for the gift boxes continues to grow in the world’s 11th-largest economy. It is now the second biggest consumer of Spam after the United States, according to Hormel Foods, despite having a population less than a sixth of the size. The harvest festival and the lunar new year account for half the annual Spam sales of Hormel’s local licensee CJ CheilJedang, said.